Of Creations’ album Reinventing Yourself is some solid metalcore, and Of Creations are on the heavier side of metalcore. This album is a bit melodic and reminds of me old school metalcore. Also, the clean singing in the album is not the whine-y kind of singing, so don’t fret too much about the singing. One thing that stood out is they used pig squeals, which not many bands do, especially metalcore bands. The third song “Obstruction of Evil” is a really well put together song. Everything is the song seems to in the right place, nothing overdone or underdone, and the whole sound of the song is great. The guitars are mostly the typical metalcore sound, which is chugging but there are quite a few melodic parts throughout the song. Vocals are primarily screams, which are low screams, high screams, and pig squeals. Secondarily vocals are clean singing, though not heard too much in the song. The singing is well done and something I think added to the song. The following song is “The Will To Abide” and it is a bit more heavier than the previous song. The sound of this song is a lot more upbeat than the previous song as well. Instrumentals are very melodic and there isn’t that much guitar chugging either. The is variety in the vocals, as they switch from low screams, mid screams, high screams, and clean singing. The screams (low and mid) sound a lot like Vincent from The Acacia Strain. If you’re a skeptic about Of Creations, I suggest you listen to this song first. Reinventing Yourself is a very solid album. It is on the heavier side of metalcore, and sometimes sounding like deathcore. The vocals are very well done, and the instrumentals are about the same. 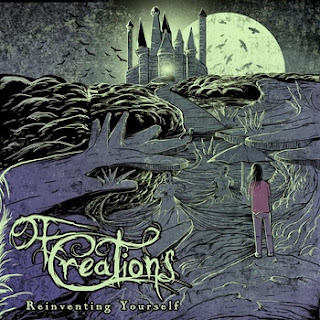 If you’re into metalcore with melodic influences, check out Of Creations!